As many parents know, kids have a knack for getting what they want from their grandmas. Known for their gentle touch, grandmothers often spoil their grandkids, whether it’s reading an extra chapter to them at bedtime, buying them an ice cream cone or taking them for a spin on the Ferris Wheel at the New Jersey State Fair. This influence can actually go both ways — in other words, just like kids can schmooze grandma into getting what they want, grandma can also be pretty darn adept at convincing kids to do various things. While some kids enjoy reading from the time they are little, others would rather play video games or head to the local park than crack open a book. Since kids typically love spending time with their grandma, scheduling time to go to the library and pick out some books can often be a very effective way to encourage kids to read. Kids may enjoy learning about family history or other shared hobbies via library research with grandparents. Once everyone returns home from the library, grandma can typically get the kids to put other activities on hold so they can snuggle on the couch and read together. Even older kids and teens who read on their own can still be encouraged to read side by side grandma. Yes, teens should definitely read the booklet from the Motor Vehicles Division before taking their drivers permit test, and yes, they should allow someone to quiz them on the various rules of the road. But by the time they reach 15 or 16, teens would rather not have mom or dad sit down and ask them questions about driving. This is another opportunity for grandma to step in and take the pressure off. Teens tend to get a real kick out of helping their grandmas get around online, so in order to help their grandchild study and also get some time together, grandma can let him or her know that she found practice tests online. Chances are good the driver-to-be will be happy to sit down with grandma with a tablet or laptop, click on the state of New Jersey and spend some time going over the questions. When kids or teens are resisting their parents’ nagging to practice the piano, tuba, soccer skills or whatever else they should practice on a regular basis, grandma may be able to step in and save the day. Parenting Weekly mentions that grandmas have the wonderful and innate ability to be mentors to their grandkids — cheering them on and supporting whatever it is that they want to do. 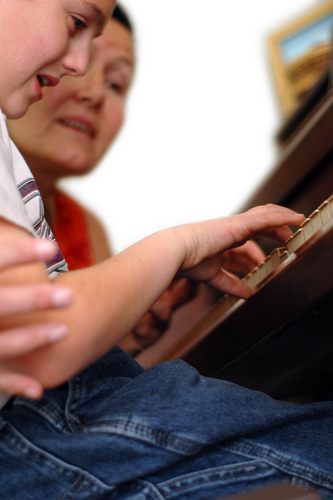 Grandma’s unconditional love and encouragement can turn a reluctant piano practice into a kiddo who is happy to show off a bit for an appreciative, and safe, audience.